Between 1970 and 1988, Canada invested more than 136 billion dollars in the development of the principal urban infrastructures (road networks, water, electricity and gas distribution systems), of which half was assigned to the construction of bridges and roadways. Unfortunately, all manmade structures wear out and deteriorate with time; they thus have a limited life cycle. For example, bridges are designed for a life cycle of 60 to 80 years. Today, the majority of the national infrastructures have reached, and sometimes exceeded, half of the normal working life. The current state of these infrastructures recently was the object of a report published by the Federation of Canadian Municipalities (FCM) . This report reveals, in particular, that 83% of the bridges and 88% of the roadways are deteriorated and require repair work to ensure permanently and in full safety the services for which they were built. In the Province of Québec (Canada), the state of the infrastructures, though better than the national average, is also alarming: 46% of the bridges and 40% of the roadways of the Montréal Metropolitan area need repair . These estimates can be considered as representative of the situation of the Province's road network (106 000 km of roadways and 8 600 bridges approximately). The accelerated deterioration of the structures is, actually, a particularly complex international problem which affects all types of construction, on the ground or underground. This phenomenon may have several origins, possibly combined, and is amplified in Canada because of the extreme climatic conditions. Faced with the importance of the damages noted on the structures, the current choices of industrialized societies are directed towards the repair of the existing structures rather than towards the demolition and construction of new structures. However, this solution involves very high costs which are in constant progression. According to the FCM , an amount of 44 billion dollars, that is to say 1500 dollars per Canadian, is necessary for the rehabilitation of the urban infrastructures. For its part, the Ministry of Transport of Québec allocates an amount of 500 to 600 million dollars each year for maintenance and conservation of the road network. Elsewhere in the world, the amounts devoted to the maintenance of structures are also very significant: 55 billion francs per year in France, and in the United States, the Congress voted on May 22, 1998 a budget of 70 billion dollars over five years for the rehabilitation roads and bridges. Whereas the public request for infrastructures in good condition increases, the available funds are insufficient and do not allow unlimited investments for the repair of the infrastructures in service. The major problem with which all the countries were confronted is the identification of a methodology making it possible to invest in their infrastructures in the most effective manner. This methodology would enable to bring right, reasonable and persuasive judgements for the distribution of funds in order to preserve the infrastructures of public usage, while taking into account the existing circumstances. The concept of management of structures (bridges, roadways, dams, etc.) was developed these last years to meet these needs. The standard flow chart of a management system of civil engineering structures is given in Figure 1. The use of such a system requires first a precise knowledge of the current state of the structures. This knowledge is essential to identify the causes, the extent, the severity of the damage, and to predict the progression of the deterioration in time. It also allows the study of the various management options and, in general, it provides a decision making tool to determine the best repair programme, taking into account the financial and material resources. Civil engineers recognise today that the quality of the decisions taken within the framework of structures management is strongly dependent on the quality of the evaluation of structures' state. An incorrect evaluation can lead to serious accidents because of the no-detection of degradations, or give place to the loss of investments in the event of useless reinforcement or repair work if the damage is over-estimated. The investigation techniques thus require a very high level of precision and effectiveness to meet the needs of the management of structures. The attention paid to the ageing of civil engineering structures and the urgent need for their rehabilitation are relatively recent. The rehabilitation of structures clearly revealed the limit of knowledge in the field of the evaluation to gather the data necessary to the analyses. The present need, which will develop further in the next years, is directed towards the non destructive testing and instrumentation of structures to obtain in-situ characteristics and properties of construction materials (cement concrete , bituminous concrete, masonry). The non destructive testing (NDT) of concrete structures is more complex than the NTD of metallic materials. Indeed, mechanical properties of various metals and metal alloys are generally reproducible, and the problems encountered are generally caused by cracks. It is thus not surprising that the non destructive testing methods developed for metals are for the detection and sizing of cracks. Unlike metals, concrete is a composite material produced by the association of various ingredients (water, sand, cement, aggregates, chemical agents). It contains from the outset a great number of defects, in the shape of small cavities, pores and interstices, and is also a material whose mechanical properties are not rigorously reproducible, even under the best conditions. In addition, various degradations appear and develop during the working life of the concrete, leading to the loss of the structural capacity of this material . Initially, non destructive testing techniques were introduced in civil engineering during the 40's. The principal need of the engineers was the in situ determination of the homogeneity and the compressive strength of fresh concrete to be able, for example, to remove the formworks. The majority of these techniques (rebound hammer, pull-out test, windsor probe test, etc.) are standardised  and are based on the measurement of the surface hardness of the concrete. With the progressive ageing of the structures, the needs of the engineers evolved to the search for tools allowing the estimation of the mechanical properties of old materials, as well as the detection and the characterisation of hidden defects. This request was at the origin of the appearance of many investigation techniques in the construction industry, and this from the 70's. The majority of these techniques  are based on those used successfully in geophysics for the exploration of basements and soils. They can be distinguished according to the nature of the phenomena exploited (acoustic, electromagnetic, thermal, electric, etc. ), and have a common principle: the response of a medium to a given excitation is a function of the characteristics of this medium. Acoustic techniques, such as the Impact-Echo , the sonic test  or the spectral analysis of surface (Rayleigh) waves , can bring information on the elastic parameters of materials as well as on the presence of discontinuities, whereas the other techniques find their principal application in the detection of defects. Major technological innovations, also accompanied by a decrease in costs, were carried out over the last few years with regard to the NDT equipment (hardware and software). Unfortunately, the acceptance of NDT tools by civil engineers is not established yet because past experiences showed more or less repeated failures. These tools need to be proven reliable on the sites through demonstration projects, before being approved by the owners of the structures. This is an essential stage to determine their real possibilities and limits (reliability, precision, conditions for implementation) in order to optimise their applications. At the present time, visual inspection remains the most popular practice for the evaluation of the state of structures. This inspection, subjective and taking into account only of the apparent state of the structures, is sometimes supported by laboratory tests on samples of materials extracted by drilling to estimate the parameters of durability such as the compressive strength or the permeability. Drilling is however destructive by nature, expensive, arbitrary and the laboratory tests do not reflect the real quality of the material of a structure, but rather a punctual quality. Bridge decks consist of a concrete slab covered by an asphalt coating. The concrete slabs generally have a thickness of approximately 25 cm and contain two mats of steel rebar reinforcements (Fig 2). In North America, the most serious form of deterioration in concrete bridge decks is the corrosion of steel rebars caused by the excessive use of chloride deicing salts during winter for the maintenance of the structures. As the reinforcement steel corrodes, it expands and creates a cracks or surface fracture plane in the concrete at, or just above, the level of the reinforcement (Fig. 2). The fracture plane, or delamination, may be localized or may extend over a substantial area. Bridge engineers are interested by non destructive testing techniques allowing to determine the delaminated areas as a percentage of the total deck area in square meter. These techniques must be fast, economic and reliable to 20%. Highway agencies wish to carry out the evaluation of bridge decks in two stages: a summary evaluation of all the bridges in service to index the decks according to the degree of deterioration, and a detailed evaluation of the most deteriorated bridges and having to undergo urgent repairs, in order to plan the repair works and to estimate their costs. the thickness of the defects looked for (delamination) is small, in the order of 1 to 2 mm. Several NDT techniques were used these last few years for the assessment of delamination in bridge decks . Up to now, the half-cell potential , the ground penetrating radar [11,12,13,15] and the infrared thermography [13, 14,15] are the most widely used techniques for this purpose. The principle and limitations of these tools are presented in the following sections. Basically, the half-cell potential test measures the degree of corrosion between the embedded steel and its surrounding concrete. This method is described in ASTM C876-80, "Standard Test Method for Half-Cell Potentials of Reinforcing Steel in Concrete". In this method, the electrical potential between a rebar and a reference electrode, normally a copper/copper sulfate cell, in contact with the concrete surface, is measured (Fig. 3). This contact is done by water filling a hole of approximately 5 mm diameter drilled through the asphalt coating. A grid pattern is used to identify locations where the half cell is to be placed to obtain potential measurements. On bridge decks, these grids generally are of 1 m´1 m. Data collected can be plotted on schematic diagrams of the structures as an equipotential contour map. The ASTM standard states that the probability of corrosion is less than 10% if the potential is greater than -200 mV, whereas potential values lower than -350 mV indicate a high probability (>90%) that corrosion is active. Values between these upper and lower limits indicate areas where the corrosion activity is uncertain. To illustrate the type of data that can be obtained using this test, results of a field survey done on the McDonald Bridge deck (Montréal), a 20 year-old structure of 105 m length and 8 m of width, are presented in Figure 4 . The results are in the form of a grey scale color map, going from the maximum potential value measured (-150 mV) to the minimal potential value measured (-650 mV). Areas where corrosion activity is present were essentially located at the center as well as at the edges of the deck. The validation of the potential survey results was done by manual sounding according to the ASTM standard D4580 " Standard practice for measuring delaminations in concrete bridge decks by sounding". The principle of this test consists first to remove the asphalt coating. The surface of the concrete is struck with a hammer, or a chain is dragged across the surface. Good quality concrete with no delamination produces a sharp, ringing sound; delaminated areas emit a dull, hollow sound. The locations of subsurface delaminations are shown in Figure 4, in relation to potential values. The percentage of delaminated areas in the deck is in the order of 7.5%. An interesting correlation can be observed between manual sounding and the potential survey. With few exceptions, distress occurred where potentials were more negative than -350 mV. However, the distribution of potential values indicates that approximately 43% of the upper mat of reinforcing steel is actively corroding, based on the estimated area within which potentials are more negative than -350 mV. These results largely overestimates the real percentage of delamination (7.5%). It can be explained by the fact that, in some locations, corrosion is initiated but is not yet in a sufficiently advanced stage to cause delamination. Several precautions are necessary to ensure that meaningful readings are being obtained. In particular, the steel must be continuous between the points of measurement and the ground connection to the voltmeter. Moreover, the test is not really non destructive and must be done on a dry deck. The measurements are time consuming and require closing of the bridge during seven to twelve hours, depending on the deck surface to be surveyed. Because of these limitations, bridge engineers prefer the use of the ground penetrating radar (GPR) and the infrared thermography techniques. This is justified by the fact that only these technologies make it possible to collect the data from a mobile vehicle. This avoids the indirect overcosts related to the temporary closing of bridges (ex. traffic control). When the bridge deck surface is heated by the sun's infrared radiation, the delaminated areas heat at a faster rate than the adjacent thicker sound concrete. This is due to the fracture plane of the delamination acting as a small insulator and trapping the heat near the surface. During a summer day, these "hot spots" on the surface are generally 2 °C to 5 °C warmer than the surrounding solid concrete  and are readily detectable and made visible by an infrared camera. ASTM D4788 "Test method for detecting delaminations in bridge decks using infrared thermography" describes the test method. The vehicle and equipment shown in Figure 5 are used to rapidly survey a section of the deck. As the vehicle is driven over the deck at speeds up to 16 km/h, the infrared data are collected in a continuous fashion and the images are recorded on videotape. A real-life image of the deck surface is simultaneously recorded. The latter is used by the operator to distinguish between the hot spots corresponding to delaminations from those induced by surface defects such as patches. The result of the test is in the form of a map showing the location and extent of delaminations in the deck. Figure 6 is a typical image of a delaminated area during day-time. The delamination appears as a white, or hot, area in the surrounding black, or cooler, background. Highway agencies find the infrared thermography technique very attractive because it is an area testing. Data analysis is simple and the results of the surveys can be obtained in real time. However, the efficiency of the technique is a function of the environmental conditions as well as of the decks conditions. A major disadvantage of the technique is that the depth of defects cannot be determined. As a consequence, it is not possible to determine if a subsurface void is near the surface, at the asphalt-concrete interface, or farther down at the level of the reinforcing bars. In addition, the resolution of the technique decreases significantly as the asphalt coating thickness increases. Infrared thermography is often used in combination with the ground penetrating radar technique to improve the reliability of bridge deck condition assessments . The principle of the GPR technique is similar to that of the acoustic sonar. A high frequency electromagnetic wave, typically from 1 GHz to 2.5 GHz, is emitted via an antenna into the structure under evaluation. The reflected energy caused by changes in the electromagnetic properties of the material is detected by a receiver antenna and recorded for subsequent analysis. Figure 6 represents a typical radar waveform obtained in the case of a bridge deck and shows the principal reflections which occur. 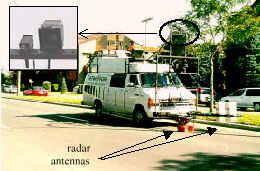 Figure 5 shows the antennas mounted on the front of a vehicle. The tests are usually done with air-coupled horn antennas positioned from 0.3 to 0.5 meters above the deck surface, or with ground-coupled antennas. The horn-antenna detects several rebars simultaneously, and thus presents the reinforcing steel as a continuous layer. The ground-coupled antenna is able to distinguish individual bars because of its close proximity to the reinforcing steel. Modern GPR equipment collects radar waveforms at a rate of more than 100/s. This high acquisition rate allows for data to be collected at driving speeds. Horizontal positioning of the data is done with the use of a distance transducer connected to the drive train of the data-collection vehicle. The location of the antennas can vary across the width of the deck and a number of passes with the antennas in different locations can be made to cover the whole surface of the deck. For a long time, GPR data analysis involved the search in the waveforms of the echo induced by the presence of delamination . This methodology was subjective and did not generate conclusive results because, even at 2.5 GHz, the radar wavelength in concrete (»5 cm) is too large to resolve the 1-2 mm wide delamination cracks. In the early 90s, different GPR data analysis based on the detection of the causes which give rise to delamination, rather than the detection of the delamination itself, appeared. These approaches rely on the GPR sensitivity to changes in concrete moisture and chloride contents associated with these deterioration processes. The total quantities of deteriorated concrete are correlated either with the spatial variability of the computed concrete dielectric constant  or the attenuation . These approaches are interesting but their reliability is variable because the interpretation of the results is difficult. The result of a GPR survey carried out on the EST way of the McDonald Bridge (Montréal) is given in Figure 7. This figure shows the spatial distribution within the deck of the attenuation of the reflected electromagnetic energy at the asphalt-concrete interface (in dB). The higher the moisture and chloride contents, the higher the conductivity of the concrete and thus, the higher the reflected energy. In general, GPR results are in agreement with the result of manual sounding at locations where attenuation was greater than -12.5 dB (see fig. 7). Without manual sounding, it would have been difficult to determine the value of the computed attenuation that corresponds to the frontier between sound concrete and deteriorated concrete. This is because site conditions that might be encountered in practice are so diversified that it might be hopeless to suggest a threshold that is applicable to all sites. With lack of adequate investigation tools, it is very difficult for the managers of structures to have a reliable indicator of the "health" of structures under their responsability, and consequently, it is impossible to establish efficient management systems. Thus, the development of technical solutions allowing to bring quantified answers to the state of the structures in service is the current concern of civil engineers and is a strategic priority for Canada. The appearance and the acceptance of an NDT technique obey a very long process, and the normalisation procedures require delays of at least ten years. The reports carried out in the past in the field of the mechanical engineering industry with the ultrasonic, radiography or the acoustic emission techniques show that this state of things is not specific to civil engineering. However, the lateness of civil engineering in this field of expertise is very significant and an effort in development is claimed, and strongly encouraged and supported by the professions concerned. This work was supported by the Ministry of Transport of Québec. Bilan de l'état des infrastructures de base dans la région métropolitaine de recencement de Montréal. Centred'Expertises et de Recherche en Infrastructures Urbaines (CERIU), 1998, 339p. Concrete durability- A Multibillion Dollar Opportunity. Report of the National Materials Advisory Board, Publication No NMAB-437, National Academy of Sciences, Washington, D.C., 1987, 94 pp. ACI 228.1R-95, In-Place Test Methods for Determination of Strength of Concrete. ACI 364.1R-94, Guide for the Evaluation of Concrete Structures Prior to Rehabilitation. Sansalone, M., Carino, N. J., Detecting Delaminations in Concrete Slabs With and Without Overlays Using the Impact-Echo Method. J. Am. Concr. Inst., 86(2), 175, 1989. Sturupp, V. R., Vecchio, F. J., Caratin, H., Pulse Velocity as a Measure of Concrete Compressive Strength, ACI SP-82-11, 1987. 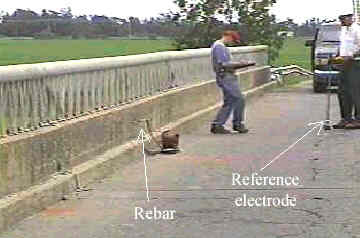 Nazarian, S., Detection of Deterioration Within and Beneath Concrete Pavements With Sonic and Ultrasonic Surface Waves. Proc. NDE of Civ. Struc. and Mater., Boulder (CO), 1990, pp. 391-406. Condition Evaluation of Concrete bridges Relative to Reinforcement Corrosion, Vol. 1: State-of the-Art of Existing Methods. SHRP-S-323, 1992, 70p. Babei, K., Evaluation of Half-Cell Corrosion Detection Test for Concrete Bridge Decks. Seattle, WA: Washington State Transportation Center, University of Washington, 1986. Maser, K. R., Condition Assessment of Transportation Infrastructure Using Ground-Penetrating Radar. J. of Infrastr. Syst, June 1996, pp 94-101. Condition Evaluation of Concrete bridges Relative to Reinforcement Corrosion, Vol. 3: Method for Evaluating the Condition of Asphalte-Covered Decks. SHRP-S-323, 1992, 84p. Manning, D. G., Masliwec, T., Operational Experience Using Radar and Thermography for Bridge Deck Condition Survey. Proc. NDE of Civ. Struc. and Mater., Boulder (CO), 1990, pp. 233-244. Clemena, G. G., McKeel, W. T., Detection of Delamination in Bridge Decks with Infrared Thermography. Transportation Research Record 664. Washington, D.C., 1978.